Interested in a few tips on installing fenders on a SWB 'bents? > shortening them? I looked through my toolbox and couldn't find anything that would do the trick. hmpf. That said, some people prefer not to cut the stays if they can get away with it -- if they do not get in the way or catch on anything. This allows one to retain flexibility for alternative set ups. A little advice that you may already know, but it's important: be sure to leave a good amount of clearance between the fender and tire. This is so nothing typical -- small stone, bit of sticky trash, leaves with twigs -- can easily lodge in there and jam the wheel. 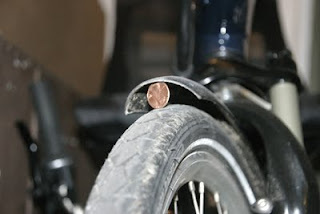 I like to leave about an inch -- about a penny's diameter -- between the tire surface and the fender. For me, fall leaves and stones are the most common catch (see photo. Shown: HP Velotechnik Grasshopper fx). The advice here relates to fenders that allow easy length adjustments. 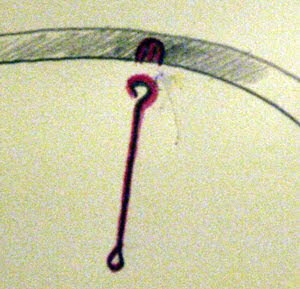 There are also common fender designs that use stays in the shape of a "shepherd's crook" (see drawing). 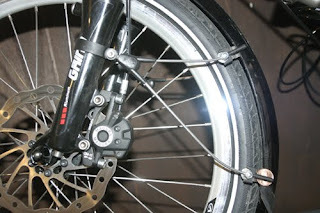 Other common designs have a fixed length rod and a plastic end piece that screws onto the fender. These types of designs don't allow easy adjustment for clearance but do allow for a welcome break-away quality if something large gets stuck between the fender and tire. At times, Rans has supplied fenders with these types of stays for their bents.